Turkey fat smithsonite is the common name for the variety of zinc-ore mineral pictured above. It derives its name from its yellow color and globular crystal habit (called botryoidal which is Greek for bunch of grapes). The yellow is due to the presence of cadmium. Early miners likened its appearance to the fat of a delicious turkey. Smithsonite, along with other lead- and zinc-bearing minerals, was mined in the lead/zinc districts of the northern Ozark Plateaus and the western Ouachita Mountains. Production started in 1857 and ended in 1962, with the peak occurring during WWI. Though mining has ceased, it’s estimated that 110,000 short tons of shallow resources remain, and significant deeper deposits may, as of yet, have gone undiscovered. Happy Thanksgiving from the Arkansas Geological Survey! 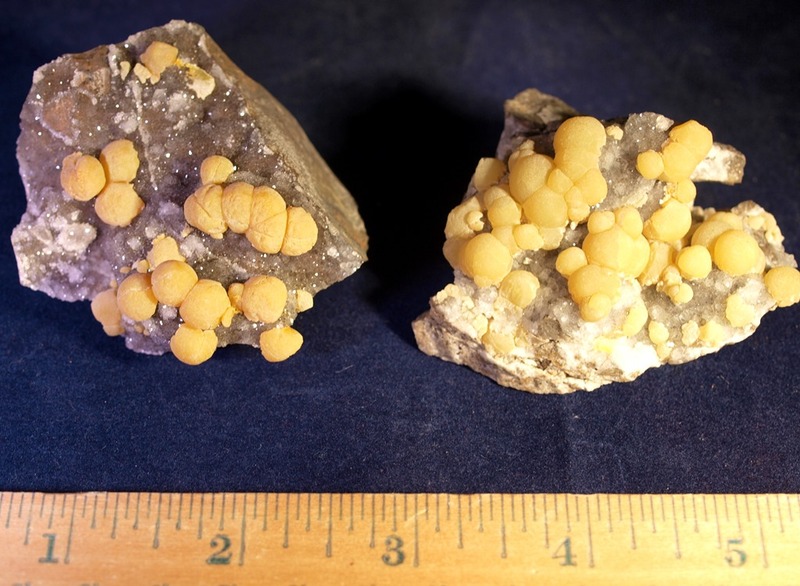 This entry was posted in #geoblog, GeoPic of the Week and tagged Arkansas, mining, Ozarks, turkey fat smithsonite, zinc carbonate, zinc district, zinc ore on November 25, 2015 by argeology.